After losing my vision at age 14 I tried to continue doing all the same activities I used to do, such as BMX and soccer. However, these didn’t last long as I would find myself losing the passion I once had for them when I’d hit a roadblock I couldn't get past; things like not being able to learn a new trick on my bike, or getting hit in the face by the soccer ball. Of course this never stopped me from trying. I spent all of my energy attempting to progress my skills in anyway I could. I’ve always been determined and my desire to be the best at whatever I did in life has always been who I am. I found climbing when a good friend told me I should come with him to the local climbing gym saying, “ you don’t need to see to climb”. I reluctantly went with him and the rest is history. My determination and passion for the sport exploded, I found myself not only climbing every single day, but training and obsessing over it. When I wasn’t climbing I was reading about climbing, when I wasn’t reading about climbing I was talking about climbing, I even started dreaming about it. I now compete in adaptive competitions worldwide, and I’m also one of the elite para-climbers helping to progress the sport of adaptive climbing by not only repeating hard climbs outside, but by establishing new lines (I jokingly call them FBAs or first blind ascents). I’ve now climbed a couple v9s and very close to redpointing several v10s and v11s. In competition I’ve also become the National champion after winning the USAC Adaptive National Championships in June of 2017 and I'm now part of the U.S National team and have recently taken 2nd place in my first Paraclimbing World Cup. As a blind rock climber, I have had quite a few people ask me how I train and what I do that has given me the ability to make big strides in such a short amount of time. Part of this is certainly due to my passion for climbing, how often I train, and how I have prioritized my life around climbing—such as always learning about new ways to train and stay injury free. However, I have to go through certain processes in order to achieve the same things a sighted person can, and these processes have a huge impact on how I approach the sport. I think that is where what I have learned could help them too. When I am projecting a climb that is difficult for me, I have to start by figuring out where all the holds are. To do this I make a mental road map of sorts. After this, I set out to “do all the moves,” creating a muscle memory of each position I need to move in and out of, or POE (position over everything) a phrase coined by Will Anglin and Rowland Chen. It refers to the understanding of movement and technique, basically prioritizing these over physical ability such as strength and fitness. This philosophy has really helped my climbing since I’m more genetically pre-dispositioned to use my fitness over finesse. But if I can use this understanding in conjunction with my fitness the results are outstanding. Moving in and out of each position flawlessly gives me the time necessary to conserve energy and focus on all the muscle memory needed to climb with my disability. This eventually leads to figuring out how to do the climb perfectly for my body type. I think it’s important to remember each one of us is unique in physical dimensions, so the way I do the sequence may work for me but would never work for a friend projecting the climb alongside me. When I feel that I have created muscle memory, I’ll start giving a project attempts from the ground. This is where I’ve gained so much strength and technique, (or at least this is what I’d like to think). I’m definitely not perfect, nor is my memory. A project to me is a puzzle I have to put together. Often I’ll forget a piece of the puzzle midway through the climb and have to improvise. Basically, I'll resort to feeling my way through the positions. You can think of it like a driving detour that will get you right back on the right route, but uses more gas than necessary. This forces me to be stronger, have more power in reserve, and use better technique in order to get me back on track. Most of the time this method works for me. However, if the climb in question is at or close to my physical limit, then often times I waste energy and skin, by the time I have it figured out I burn out and am forced to come off the climb. This is where the frustration really sets in. “I know I can do this thing”, I say to myself. Watching a friend do the same climb in such a shorter time frame than I can because of his or her ability to improvise with his sight perturbs me to a high degree. Of course I’m psyched for him or her, but the frustration still lingers. 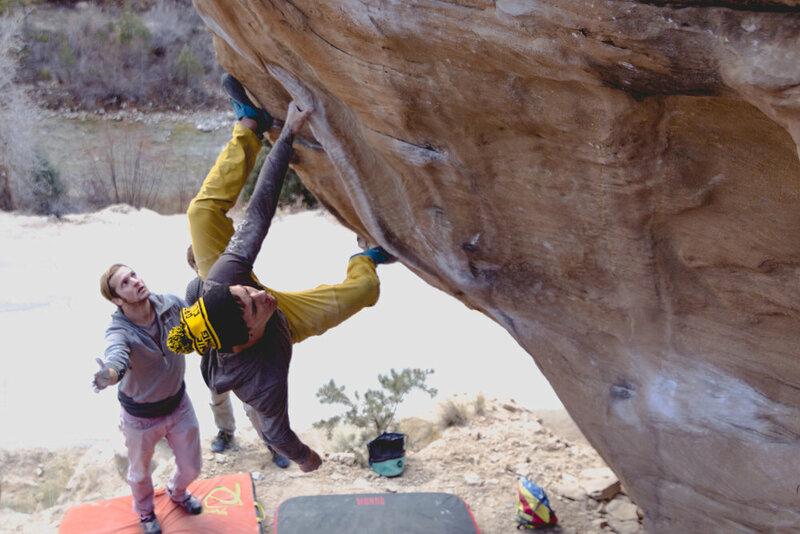 Most of the time I essentially climb the route over a dozen times and do it almost flawlessly but miss a hold, or take too long to set my foot, even pausing too long to assess my memory of the next action to perform. These are just some of the things that can make or break the send for a visually impaired climber. Of course I know that all of us go through similar processes on projects, think of Nalle on the Lappnor project for instance. The world's first V17, now known as The Burden of Dreams. It took him around 4 years to complete this project. He talked in depth about the process he went through while working on the problem. He said not only did it test him physically, but it tested him more than ever mentally. Like any other part of the body the brain is a muscle too. It requires constant training and refining to perform at the level we ask it to. Arno Ilgner touches on this in his book The Rock Warrior's Way. If you were asked to do a one finger one arm pull up without ever having trained such a thing before, you’d likely break your finger. This is the same with the brain; if you were asked to project a climb that would take you so long you weren’t sure you could ever do it you’d get shut down mentally and probably give up completely. Therefore it takes time and mental training to develop the patience and mental fortitude needed to work through hard routes and boulders. This is what has given me a edge. The fact that it takes me so long to work through these type of things has given me the sharpness and patience to focus and get the job done regardless of my vision loss. I have learned valuable lessons that would be otherwise missed if I wasn't visually impaired. In fact, I am thankful that I take longer than other climbers. I am thankful that I cannot just make a mistake or forget where my foot is supposed to land. It has taught me patience that I now use in my everyday life. In fact I find myself comparing everyday situations to the struggle I face while projecting a climb. Thinking: “this really isn’t that stressful, if I got through that last boulder after so many times on it then damn, this is only like V2”. I am beyond grateful for these gifts of mine and would refuse a trade for any other gift. It is a part of my story, and if explaining this can help others in anyway I’m content with my predicament, and glad to be a voice in the climbing community.